Chances are that you're reading this review on a CRT (Cathode Ray Tube) monitor. 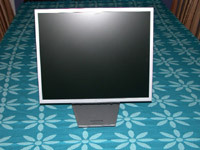 LCD (Liquid Crystal Display) monitors are an alternative to CRTs that gained popularity initially as screens for laptop computers (since lugging around a CRT monitor isn't exactly an easy thing to do). 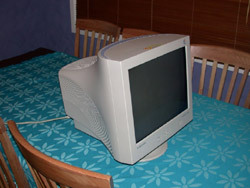 Early LCDs were optically poor replacements for CRT monitors, only really being put up with because of the weight and power savings they brought with them, but as the technology for producing them improved, they have become more and more desirable, leading to an increased demand for LCD monitors to be produced for desktop computing as well as in laptops. LCDs work in a rather different way than CRTs. Sandwiched between two very thin layers of transparent material (normally glass) is an array of liquid crystals, which, when electricity is passed through them, will block or allow light to pass through them (depending on the voltage used) Each "pixel" is actually made up of three sub-pixels, being red, green and blue respectively. Behind the LCD panel itself is a backlight, which projects light through the crystals, causing them to light up and produce a display. You can read more about how LCDs work on this page. LCDs aren't without their problems. They're quite flimsy when compared to a good solid leaded-glass CRT and can be relatively easily damaged. They often display "ghosting", where an image which is moving across the screen leaves "ghosts" of itself behind it, due to the slow speed at which the liquid crystals change colour. CRTs don't have this problem - as soon as electrons stop focusing at the phosphor-coated screen, it stops glowing. LCD panels, because of the way they are made, have what is often called a "native" resolution - this is the maximum resolution at which they will work, which is a simple limitation of how many individual pixels are present in the LCD panel. Running an LCD at a resolution higher than this "native" resolution is impossible (the LCD won't accept the signal), and running it at resolutions lower than the native resolution can lead to a rather "blocky" or odd-looking picture. LCDs can also have what are called "dead pixels" - where a liquid crystal "pixel" is stuck at a certain colour, no matter what voltage is applied to it. An LCD panel is considered to be faulty if it has a certain number of dead pixels on it - though the exact number, and their location on the panel is often a matter of conjecture between customers and manufacturers. Again though, as manufacturing processes are improved and refined, the number of panels being produced with dead pixels is being reduced - to the point now where some manufacturers (Samsung and Acer being the first to my knowledge) are now offering a zero defective pixel tolerance policy (Samsung for the first 7 days after purchase only). As I mentioned before, LCD manufacturing technology has improved to the point now where LCD monitors are becoming an affordable option for desktop users, and their performance has improved to the point where they're becoming more desirable. The number of LCD monitors being manufactured is also increasing - it was claimed by several monitor industry members that more LCD monitors were manufactured in 2003 than CRT monitors for the first time. As yields improve, prices will start to drop until LCDs are actually as cheap as, or even cheaper than, CRT monitors. Whilst LCD prices don't seem to have dropped a lot lately, the level of technology and performance you're receiving for the price you pay is getting higher. 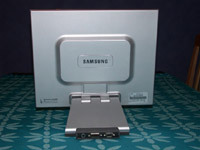 This is certainly apparent in the case of the Samsung 172 series of monitors - the 172x which is the focus of this review, is priced a few dollars cheaper than its predecessor, the 172T, and yet comes with more features and higher specifications. Speaking of specs, let's take a look at the 172x on paper. Compare those specs with my 19" Samsung SyncMaster 955DF CRT, which cost around the same when I bought it as a 172x costs now. Some specs from the 172x aren't listed here because they're LCD-specific. From the specs you can see that although the 172x is a 17" monitor and the 955DF is a 19" monitor, there's only really 1" difference in viewable area. This is due to the fact that whilst LCD screen sizes are measured by what you can see, CRTs are listed by their picture tube size - even though some of the picture tube is hidden behind the monitor bezel. According to the specs, the 955DF has a better pixel pitch, but this isn't ENTIRELY as bad as it seems - pixel pitches are measured in different ways on CRTs and LCDs, due to the way they actually display their pictures. The pixel pitch on a CRT is measured by taking the distance between one dot of a given colour and the nearest dot of the same colour. However, due to the way pixel are arranged, this isn't as clear-cut as it would appear. Without getting too far into the mathematics of it, a 0.2mm pixel pitch CRT monitor such as the 955DF can be said to have a TRUE pixel pitch of around 0.23mm. So whilst the pixel pitch on the 955DF is still better, it's not quite as bad for the 172x as it might first appear. The maximum resolution issue isn't so bad either - whilst the 955DF will accept a 1600x1200 signal, it doesn't actually have enough physical pixels (or dot triads) to display the 1.92 million pixels required for a true 1600x1200 resolution. The recommended maximum of 1280x1024 is much closer to the monitors actual capabilities - and is shared with the 172x.